kt literary » Blog Archive » Witty Women’s Fiction — What Is It? Witty Women’s Fiction — What Is It? Apparently, the theme of my posts this week is going to be all about queries and genres. Which is cool by me! Today I want to talk a little more about what I termed “witty women’s fiction” on my submissions page, and what that means in terms of what I’m looking for. I’ve used an image of one of Jennifer Crusie’s books, Bet Me, as the illustration for this post, because I think her books are almost exactly what I mean. But perhaps this is a little unfair. After all, Crusie came to prominence as an author through traditional category romances, and yet, I’m not looking for category. Maybe it’s easier to say what I’m NOT looking for under this rather broad umbrella. I’m not looking for historical romances, regencies, highland romps, western bodice rippers, or anything like that. Despite her popularity, I’m not looking for the next Jodi Picoult — her novels tend to get me down, and I’m rather laugh with a book than cry. (Although, to be honest, I do enjoy when I can do both in the span of a single book!) I’m not looking for a series of detective novels with a female lead, not matter how sassy she may be. Likewise, you can keep your female Jack Ryans and Alex Crosses — thrillers aren’t my cup of agenting tea. I don’t want aging women looking back on their lives nostalgically or taking ridiculous leaps into something new, just for the sake of shaking things up. It’s highly unlikely I want your memoir — unless you’re Felicia Day. Even then, please note the word “fiction” — I’d prefer a novel, please, Ms. Day! What I think I’m most eager for in this genre are characters that feel real, in real situations, even if “reality” is stretched. Paranormal may still work, but not if the characters behave in unbelievable ways. And I’ll be honest: I have one client who writes in this genre, and though I gets hundreds of queries for women’s fiction, very little of it is what I’m looking for. I may have set myself an impossibly high bar with my interests, but if that means I never find what I’m looking for, I’m ok with that. There’s a good reason why I specialize in YA and MG fiction, with witty women’s fiction and pop culture narrative non-fiction as secondary interests. They are secondary. Tertiary, even. Other questions about this genre? I’d be happy to answer them in the comments! So would Mary Janice Davidson be included in that witty women's fiction category? I love how specific you are about what you're looking for. It gives hope to those who perhaps have written a "witty women's fiction" novel and been turned down by other agents. 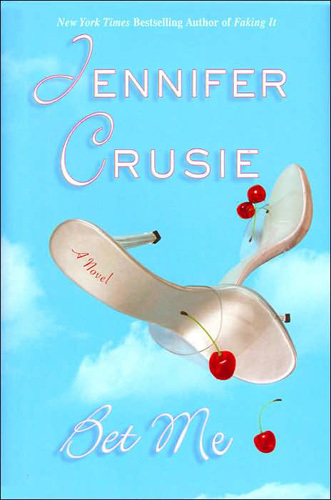 Jennifer Crusie's Bet Me is my favorite of her books (I especially liked it when she calls him "Charm Boy"). I've heard from some sources that women's fiction is a new name for chick-lit, but you seem to request both. What are the distinctions? Also, if you have a MC who is say, in her later years of college, would you consider that women's fiction or YA? Thanks Kate! Love the blog. I was working on what I would consider a witty women's fiction tentatively named Mommies Incorporated, but I shelved it. It had some sequel potential too. I was told that the genre was overdone. I have no idea what makes a genre "overdone." I'm mean, I'd be happy if there wasn't another vampire book for the rest of my lifetime – but that's just me. And I did read all of Stepanie Meyers' books. So, do I take it off the shelf and finish up – maybe see where it goes? As promised, additional answers to your questions! Rissa, I love reading MaryJanice Davidson, though I'm not quite sure if she's not just funny paranormal romance. That said, if you have the next MaryJanice Davidson, I'd love to take a look! Sophie, a lot of people do conflate chick lit with witty women's fiction — I think it's about more than just boys, booze, and jobs, even when it's JUST about boys, booze, and jobs. A lot of chick lit is entertaining but forgettable. I don't ever want the books I rep to be forgotten! As for a college age MC, I think that could fit into this category, sure. And Shannon, it sounds like your novel might have possibly fallen into a trend called "mommy lit," which was popular for a while but has fallen a bit out of favor. It was seen as the next step beyond chick lit, for readers beyond stories of crazy singletons looking for love. It is similiar to MaryJanice Davidson- but is more of an funny urban fantasy than a funny paranormal romance- though there is romance. Daphne has my query, and I am hoping you will want to take a look at it. Thanks for the wonderful answer!I now feel a lot more comfortable querying my novel as "women's fiction". "What I think I’m most eager for in this genre are characters that feel real, in real situations, even if “reality” is stretched. Paranormal may still work, but not if the characters behave in unbelievable ways." As in, not high/epic fantasy but wings might be ok? There's no magic in my book, but there are Faye people with wings. It's not set in the current-day though, so I suppose it would be more historical and not in your area of expertise. CRISP WHITES tells the story of Nina Yusof. Irish Nina and Greek Stavros are living a typical Australian love story. They have survived the fallout of their cross-cultural marriage, and have stuck together through highs and lows. Nina is a hard worker, a faithful wife and a joyful mother… but she is also restless. She craves something… and it turns out to be adventure. Making a radical detour from the main road of her life, and in the face of her husband’s doubts, Nina joins the Navy at thirty-three. Crisp Whites tells the story of her initial training – the most life-changing six months imaginable. More than once, Nina feels doubt – what has she gotten herself into? All of her assumptions about herself; her life, her work and the nature of love, are turned upside down. She is challenged, exhausted and far from home, but she is tougher than she realises. Thrown together with a motley crew of men and women, Nina and the rest of New Entry Officer Course 25 must overcome enormous physical, mental and emotional hurdles… luckily there is plenty of pranking, flirting, and some ill-considered melon liqueur to lighten the load. The different dimensions of the genres hurts my brain sometimes. If I had to compare my MS to a movie (I know, but I love movies :-)), I say it is similar to "Working Girl." Maybe I'll finishi it and see where it falls. And, thanks Kate for being such a resource for all of us. I can't think of another agent that would actually respond to every query and blog like you've done. Kudos to you! I truly appreciate it.